While Lancaster lost points for being a UGA grad, Topkin is a Drake University graduate. Don’t know where Drake is? That would be Des Moines, Iowa. The hometown of Jeremy Hellickson and about 90 minutes west of where we did our undergrad work (that’s 90 min by car. 4 hours by tractor). Like his counterpart at the Tampa Tribune, Marc Lancaster, we have at times been pretty hard hard on Topkin. We love it when he shills for the Rays. But our favorite is when he called a game in Mid-May “something of a must-win game” or the time Jason Hammel gave up 2 runs in 6 innings and Topkin called it a “gem”. We should just be grateful he is not the Rays GM…We haven’t always been so negative. We have seen glimpses of what could be. And of course there was the Barry Bonds rumors this past Spring that were almost single-handedly started by Topkin. We should give him a pass for that cluster-f*** as that story certainly drove a lot of attention to Topkin and the Times. So, even if the story was greatly exaggerated, it was a smart business move. It is just too bad that we as Rays fans had to pay. 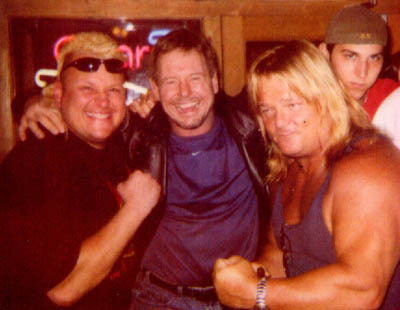 Sorry, but I'm pretty sure that's a picture of 'Rowdy' Roddy Piper standing with 'Nasty Boy' Brian Nobbs and Greg 'The Hammer' Valentine. THAT is Roddy Piper? I remember Rowdy Roddy. He has changed. Still no word on who makes room for Bradford? Reyes has been DFAed. As per the Heater, "The Rays have 10 days to trade, release or pass him through waivers." Topkin has my vote as a great reporter. You gotta give him credit for perseverance--covering the Rays when they were in the basement for 10 years could not have been a good time! Marc does a great job. He keeps "the heater" so current, I often feel like I am walking around the clubhouse myself. His stories are witty, and even when his jokes miss you gotta give the guy props for the effort. Plus come on, even Stu admitted to reading Topkin first. If he earned his read, he certainly has mine.